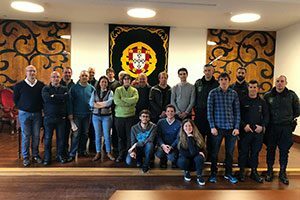 A group of students from the Department of Informatics Engineering of the Faculty of Engineering of the University of Porto is developing a mobile application that aims to help identify landowners’s properties in need of cleaning. This project, entitled “Safe Forest”, is being developed in partnership with the Tondela Municipal Council in order to prevent forest fires, in this extremely affected area in October last year. After an initial visit, in February 2018, from the Department of Informatics Engineering, led by its director João Cardoso and some subsequent conversations with the Municipality of Tondela, it was defined that the software and applications will be developed within the curricular unit of Laboratory of Project Management (LGP). A team of students, who in the meantime created the fictitious company APPly, is working together with the GNR Prevention and Relief Intervention Group (GIPS) and with other local agents to develop a functional prototype in the creation of a forest register which can identify who owns each territory, as well as the state of cleanliness and conservation, and gather relevant information to help prevent future fires. It also seeks to promote more active citizenship by allowing citizens to contribute data and reporting problems in implementation. The project is being guided by Professor Ademar Aguiar, specialized in Software Engineering, and integrates students of Computer Science and Computing, Multimedia, Service Engineering and Management of FEUP, as well as Communication Design students from the Faculty of Fine Arts (FBAUP).